I love Banana Ice Cream! It is always so deelish and you can have so much fun playing around and making so many yummy flavors. Michael and I were Loving this one! Sundaes are so comforting and fun to eat. They are even more fun when they are healthy and delicious! Start off my combining the frozen bananas, nut butter, agave nectar, vanilla and dash of sea salt in a Vita-mix, blender or food processor until well combined and smooth. Have 2 serving bowls ready and using a large ice cream scoop or spoon, scoop out 1 scoop for each bowl and set in the freezer. 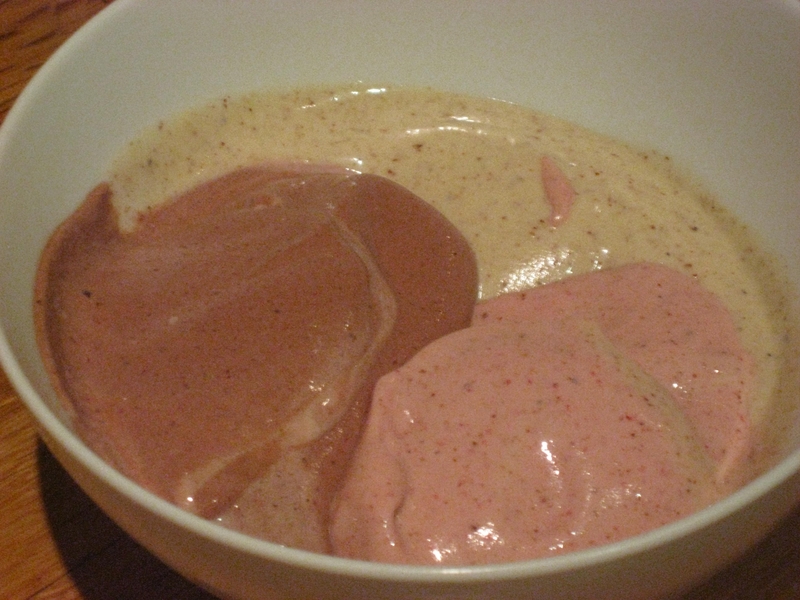 Next, add the frozen strawberries to the frozen banana mixture in your blender and process until well combined. Take the bowls out of the freezer and add 1 scoop of the gorgeous strawberry “ice cream” to both bowls and put back into the freezer. 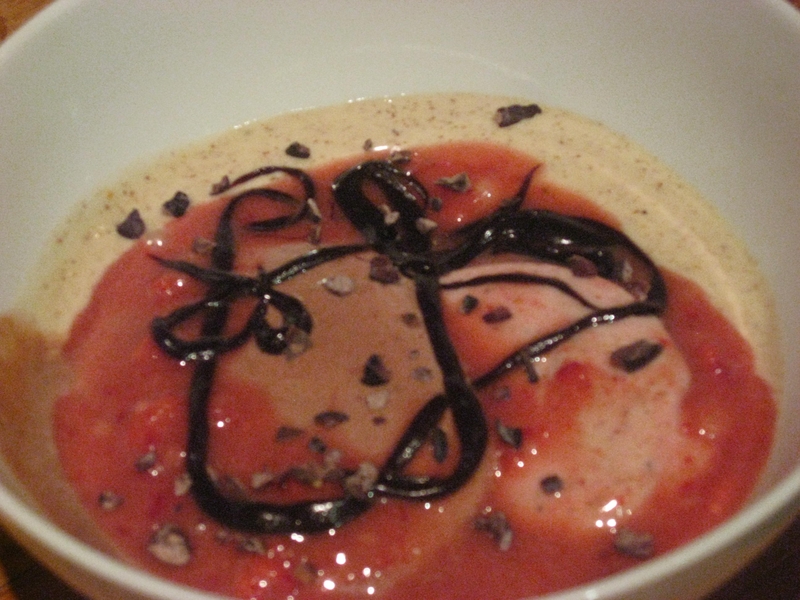 Add the cocoa powder to the strawberry “ice cream” and process until well combined. Take the bowls out of the freezer and add 1 scoop of the chocolate “ice cream” to both bowls and put back into the freezer to set. Feel free to eat as is or add toppings. 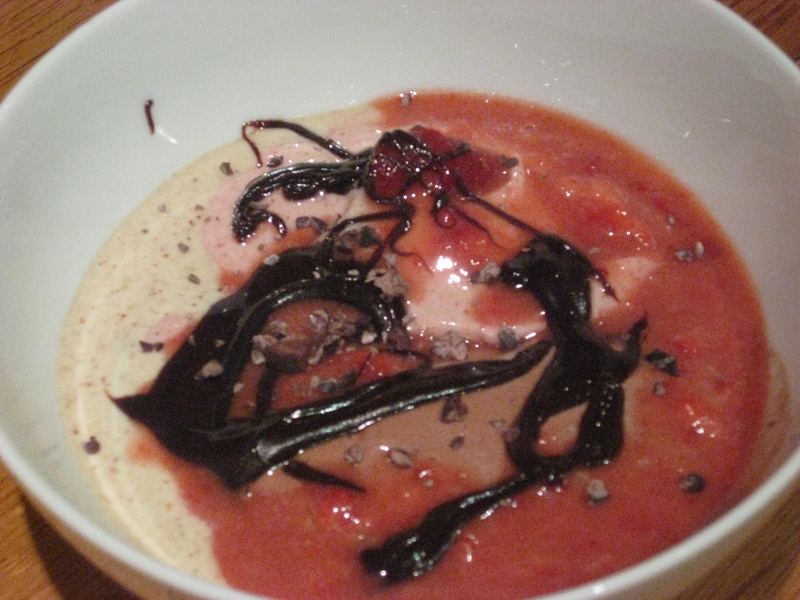 I made a strawberry sauce out of agave and strawberries in the blender. I also used chocagave on top, yum! Use nuts, cocoa nibs, etc. This was so delightful and I loved the color so much that I had to feature it in a special glass. I always make banana ice cream as my go to dessert (see my Banana Ice Cream Love) and decided to make strawberries the star this time around. YUM!!!!! 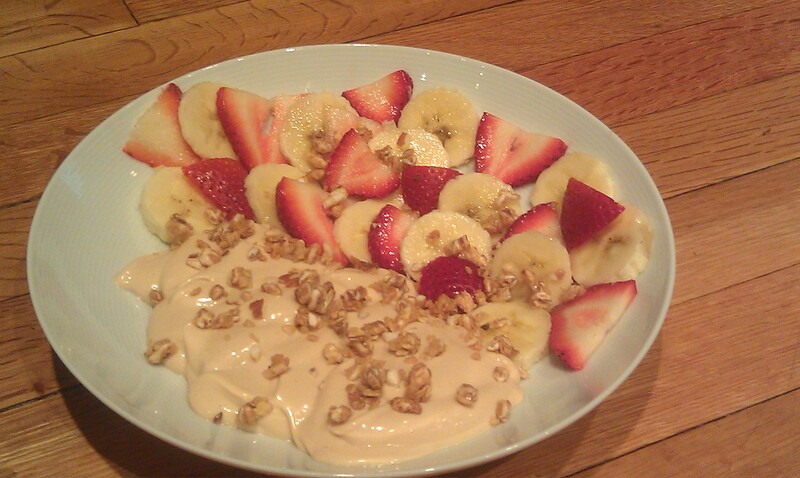 In a Vita-mix, processor or blender combine everything except the cashews and fresh strawberries. If you are having some trouble blending add a little bit of water. Pour into a pretty glass or bowl. 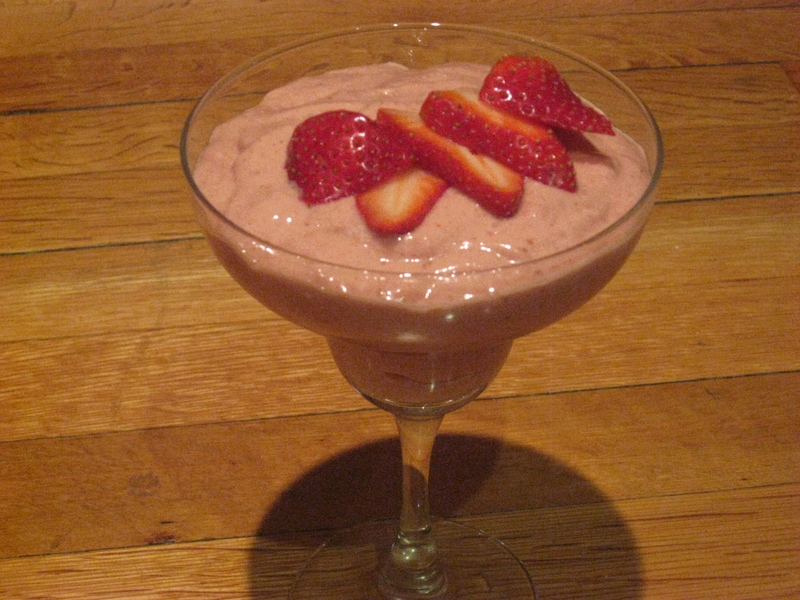 If you prefer to have this a little creamier add cashews to the blender with all the other ingredients and blend away. I chose to do a half and half…. 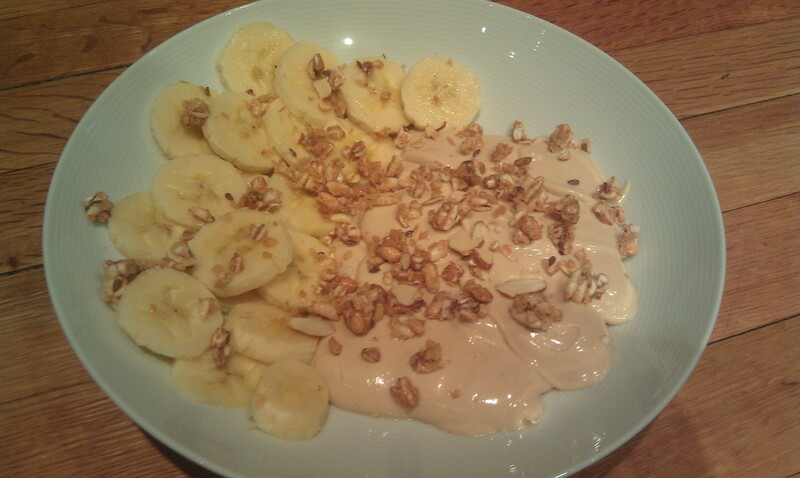 I poured out half the mixture into our bowls and then added the cashews. I poured that mixture on top of the bowls. 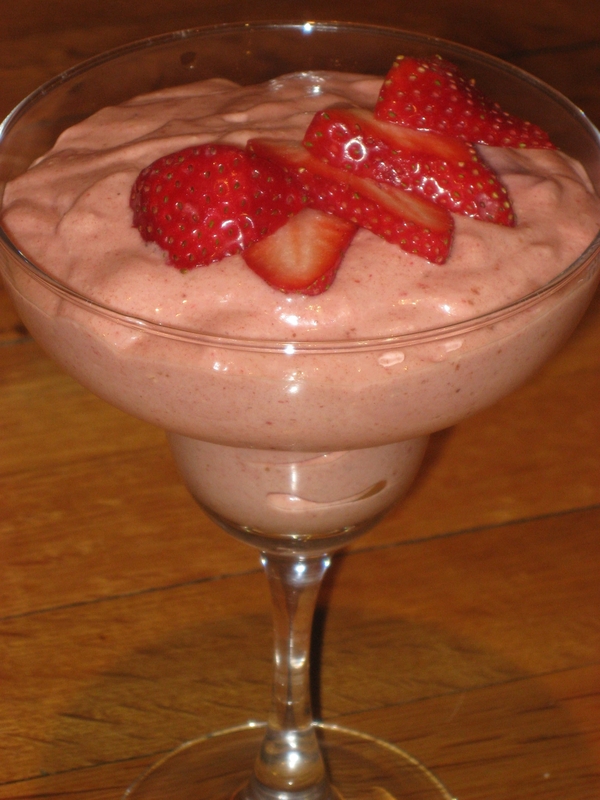 Add fresh strawberries on top and enjoy tremendously! YUM! It was our 1st anniversary this weekend (yeah!!!!) and I thought what better way to start it off then with some delicious and decadent crepes! mmmmm! These were amazing! They were also pretty light as we were not weighed down by sugar, flour, heavy cream etc. 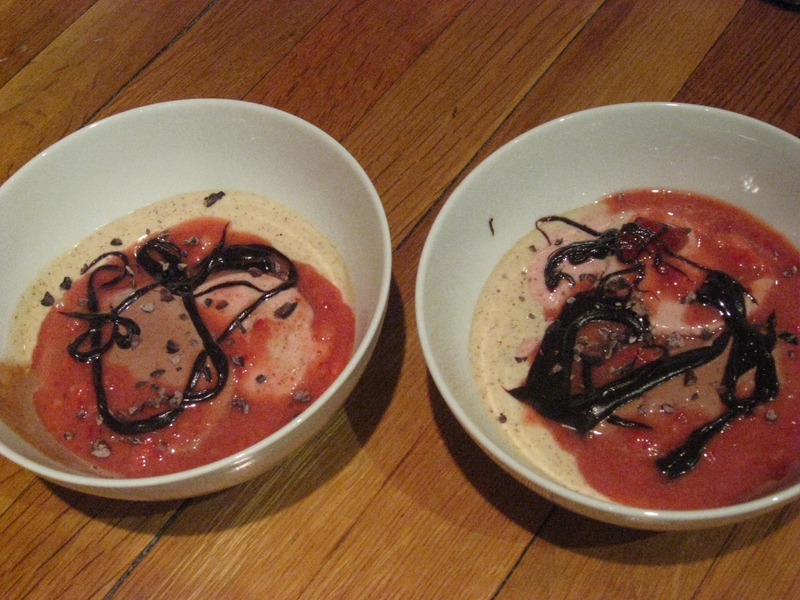 The crepes had the texture of banana fruit roll-ups and went so perfectly with the cream and the berries! There was only enough cream for 6 of the crepes, but 3 each was more than enough. They were so good! They were also quite simple. You have to plan ahead with the crepes and soaking the cashews but they are both so quick and easy it was no trouble at all 🙂 and soooo worth it! Place bananas in food processor. Add lemon juice and process until liquid. Pour into 5″ rounds. Dehydrate overnight at 110. Do not over dry these. You want them to be flexible. Place the cashews in Vitamix blender. Blend on high speed. Add the coconut meat, vanilla and agave. Process until well blended. You can refrigerate to thicken if needed. Spoon the Cashew Vanilla Cream into half the crepe. Top with berries and add more cream. Fold over and experience joy! How fun is this dessert! I have always felt that you eat with your eyes first, so I love the colors and fresh take on this age old dessert. I know that the bottom later has nuts it in, but I love that the rest is nut free! We make banana ice cream all the time in my house as a quick go-to dessert, so this was a great way to mix it up a little. And now that it looks like the temperatures are finally rising, who wouldn’t love a big, delicious ice cream cake in their freezer?!?! The crust tastes like a fudgey cookie; the chocolate and the banana layers are like smooth ice creams and the strawberry layer is like a sweet/tart sorbet to round out the whole cake. mmmmm…. Drain dates and combine with other ingredients in food processor. Blend until very smooth. Press into spring form pan and freeze for 30-40 minutes. Combine all ingredients in food processor and blend until smooth. Pour over the Chocolate Ice Cream Layer and smooth out with knife. Freeze for about 30-40 minutes. Combine all ingredients in food processor and blend until smooth. Pour over banana layer and smooth out with knife. Freeze for at least 6-8 hours or overnight. Serving: Remove spring form pan sides. Lift off with the wax paper and place on serving tray. Let stand at room temperature for about 5 minutes prior to serving.You will need a sharp knife to cut through the berry layer. Return to freezer when you are finished serving as this dish will melt quickly. Seriously!! The Cake recipe was not super difficult but it was time consuming since all the layers have to set in the fridge for a while. But it was well worth it! Oh My Goodness it was good! Thank goodness there is still so much in the fridge 🙂 I am sure there are people out there who think that eating Raw means no dessert. Well I can safely say this cake will prove them wrong! It is also nice to know that although it is dessert, these are still ingredients that are healthy and good for you, but still should not be eaten in excess. *Lecithin is derived from soybeans and acts as an emulsifier. Look for lecithin (preferably non-GMO), in granules or powdered form, at your local HFS. If using granules, make sure to grind them up in a high speed blender of coffee grinder. Place dates in food processor and process until a smooth paste forms. You may need to add a little water. Then add the rest of the ingredients and mix until smooth. Grease a spring form pan with a little coconut butter or line a large margarine tub with plastic film. Next form an even layer on the bottom with half of the cake mixture. Top with 1/2 of the strawberries, followed by some of the whipped cream. Set in fridge for 20 mins. When firm, form another cake layer. Then top with more strawberries. (Remember to save a few for decoration). Again top with whipped cream and set in fridge 20-30 mins. When firm, gently remove cake from the pan or margarine tub and place on serving plate. Decorate with strawberry slices and serve. I know I had already made dessert, but this salad was so decadent it felt like dessert for dinner!! The texture and taste of this dish is so delightful! This would be a perfect appetizer for a spring or summer party! It is also so simple you could throw it together in 10 minutes! Whisk the lemon juice, honey, olive oil, salt, and pepper together. Arrange the avocados and strawberries on 6 salad plates. Drizzle the vinaigrette over the fruit salad. Serve immediately.